Hi Tarman - Any chance of getting copies of the CPO art and Side Art. I am going to try printing my own just for grins. Thanks to all who have contributed to this - it inspired me to buy and fix-up my own Super Off Road. Got the game working great, now just need to get it looking sharp. Thanks again for all the information and inspiration! I recently picked up a Super Off Road and have started working on it to get it to run properly. One of the wheels has an encoder disk that has some broken parts. Is there a source to buy replacement parts for these wheels? If not, what is the best route, weld on new metal fingers? Also, one wheel only turns one direction, is that a problem with the interface board, or something else? One of the wheels has an encoder disk that has some broken parts. Is there a source to buy replacement parts for these wheels? Not sure, but I think this might be what you're looking for. 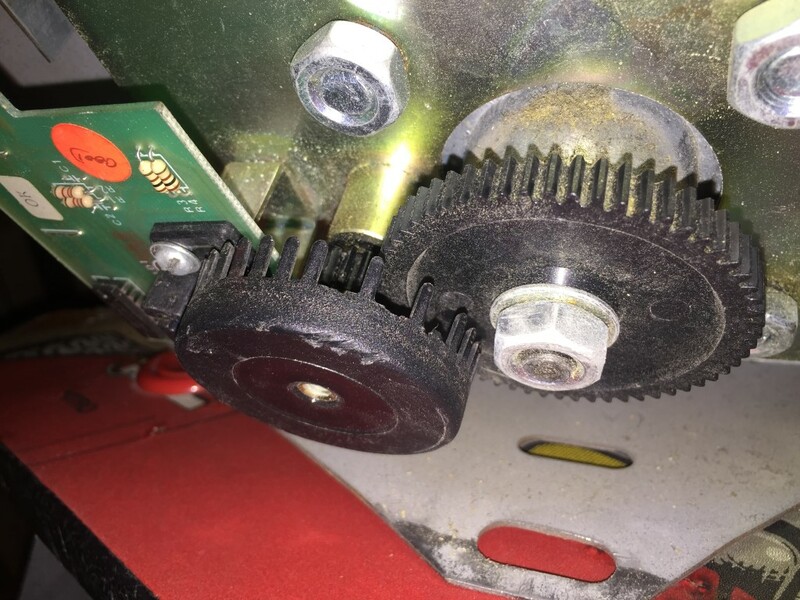 It could be mechanical misalignment (based on the broken teeth) but it is almost certainly not an electronic problem in the encoder board. If it is an electronic problem, it would be on the game PCB since both data lines have to be working to register a turn of more than one step. No quadrature waveform transitions = no turn. Only one data line working = wobble back and forth one step. How about starting a new restoration thread all to yourself? 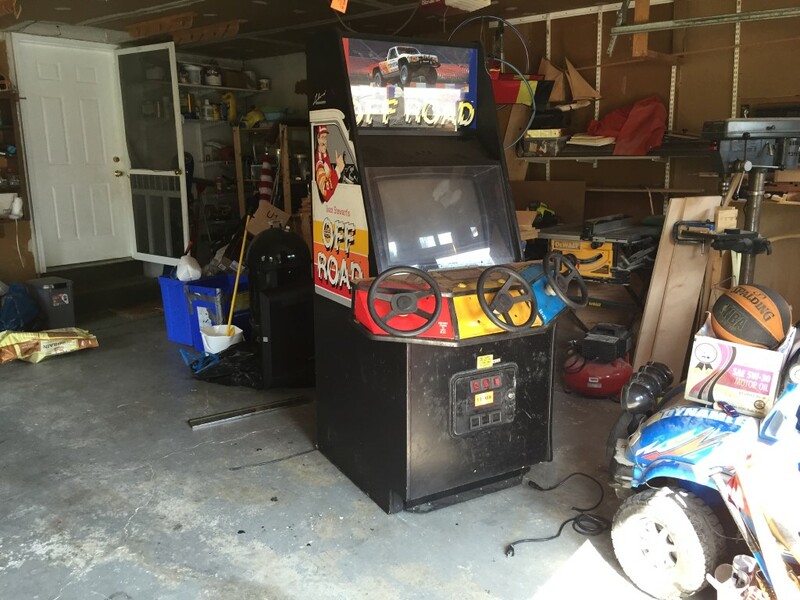 I hope to pick one of these up some day and I would love to watch along with this restore. Probably not enough to do that isn't any different or even better than what is already in this thread. I have replaced the plexi on the front that was damaged, replaced the power cord, and scrubbed a lot of the dirt and grime off the machine. I will clean up and try to get the wheels working as nicely as possible. The metal for the middle player wheel is really bent up on mine, so I am trying to straighten it out as best I can. One of the buttons is broken, so I will be replacing it. Because the others look to have lost some of their color I might just replace them all. The admin button is missing too - just a hanging leaf switch that doesn't work and no button. So that needs to be replaced. All the T-Molding is in need of replacement. I was thinking of using something other than black but I think that will show some of the spots that the cabinet has swollen wood. Top of the CPO needs new artwork. Probably not in the budget just yet. If and when I do replace that, I might just replace that entire piece of wood too. The pedal covers are missing - not sure where to source them. Bottom right side of the cabinet the wood and laminate are in very bad shape. Hey Paul your game looks better and may actually WORK, but I'd like to bet your pedal panel doesn't look THIS GOOD! Hey ZORK2, could you please message me about your pedal panel? I know I am resurrecting an old thread, but as this thread is one of the few results in Google for this topic, and everything in it is still valid, I thought it would be ok and helpful for people searching for this information. I just posted a 3D printable model of that steering encoder wheel to Thingiverse (link below). If anyone needs replacement encoder wheels, grab the file and print or have a friend w/ a 3D printer some off for you. I printed my first test in black ABS and was shocked that it worked right away without having to tweak anything. Page created in 0.208 seconds with 29 queries.